We adore this sweet, sweet top and bloomers outfit for baby boys by Zuccini! 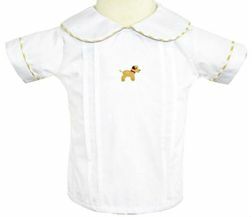 It is made with a white blouse that has two pleats on either side of the center chest. On the chest is applied the cutest little hand French knot crocheted Labrador puppy. 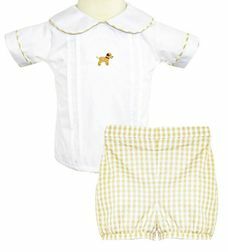 The top is trimmed with khaki gingham and paired with khaki gingham banded leg bloomers.